Sunny Rajab, CEO of Business Communications Solutions (BCS), founded the woman-owned company in 2001 and has 20 years of experience in business technology consulting encompassing: telecommunications, audiovisual systems, IT networking, and structured cabling. She holds a Bachelor of Science degree in Management from Pepperdine University and an Executive Master of Business Administration (EMBA) from the University of Southern California (USC). She is a C7 low-voltage licensed contractor. As a hands-on CEO, she takes the initiative by mastering operations of all the technology solutions BCS provides its customers. Ms. Rajab began her career working for a start-up in the telecommunications industry but decided to launch her own company as a single-source solutions provider of structured cabling, phone equipment, telecommunication plans, and IT networking. She recognized the need and opportunity to help business owners save time and cost, and avoid headaches, by eliminating the need for multiple vendors. Ms. Rajab and BCS do not wait to catch up with new technology; rather they stay ahead of the curve by adopting innovative tools early on to find solutions that will help businesses grow into the future. Evolving from the telecommunications industry, Ms. Rajab decided to span the BCS product offerings in seeking out new opportunities in the audiovisual (A/V) and security surveillance markets, while continuously growing her business expertise to include design and project management consulting for A/V and networking solutions. She believes the best way to know the solutions BCS designs and installs is to be an end-user herself. All products supplied by BCS have gone through exhaustive in-house testing at the company’s facilities in order to provide the best Quality Control. Ms. Rajab’s foresight for innovation, combined with her experience and expertise in business technology, has made her and BCS a trusted consultant for businesses of all sizes, including many nationally noted Fortune 100 companies. 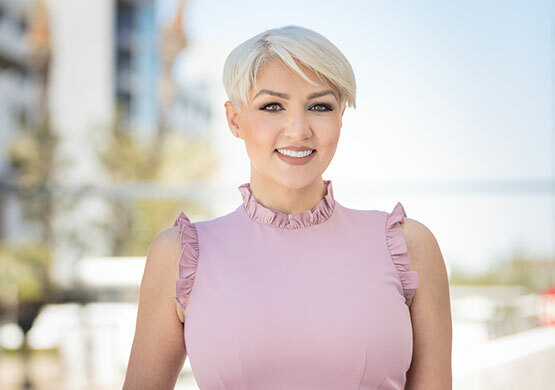 Outside of BCS, Sunny is a mother of two children and is affiliated with a multitude of local and nationwide charity organizations, along with founding an investment firm and property management company. After her daughter was diagnosed with Stage IV cancer in 2016, Rajab increased her philanthropic activities by founding a charity in her daughter’s name (Shayda Strong Foundation) which provides support for children battling cancer. To learn more about Shayda Strong or other community involvement, please visit our “Community” page.